It was a holiday evening and I was at my good friend Peter's house for dinner. You already know that he is one of very finest wine writers and critics, and that he is the author of ChampagneGuide.net, and that he recently published a long-awaited Sherry book. But did you know that he is a wonderful cook? Peter can cook anything but prefers to cook in the Japanese style. And on this Christmas eve, I hung around his kitchen while he prepared dinner. We talked about how his book is selling, how my work is going, about our plans for travel in the coming year, about how I miss my kids on the Christmas holidays, and all sorts of other things that good friends talk about. We drank Champagne. Good music wafted from the sound dock speakers. Peter made several dishes but the centerpiece of our meal was rice. 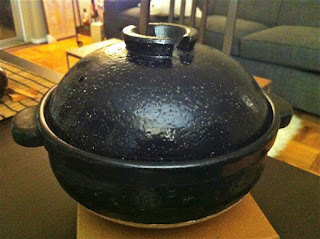 He uses a Donabe, a Japanese clay pot, to cook rice. The particular Donabe Peter uses is made of a special porous clay from the bottom of Biwa Lake in Iga, in Mie Prefecture. It is prized for the way it retains heat. 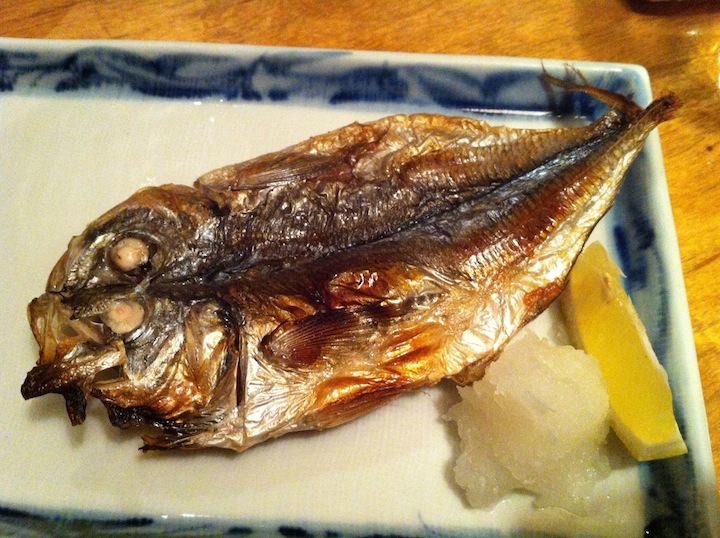 He used Koshihikari rice from the Niigata Prefecture in Japan. This is thought by many to be the finest rice of Japan. Peter rinsed the rice many times, massaging it with his hands, until the water ran almost clear. Then he spread it evenly in the bowl and let it dry. Then he combined water with a dash of fish sauce, sesame oil, and sake, and soaked the rice for about a half hour. 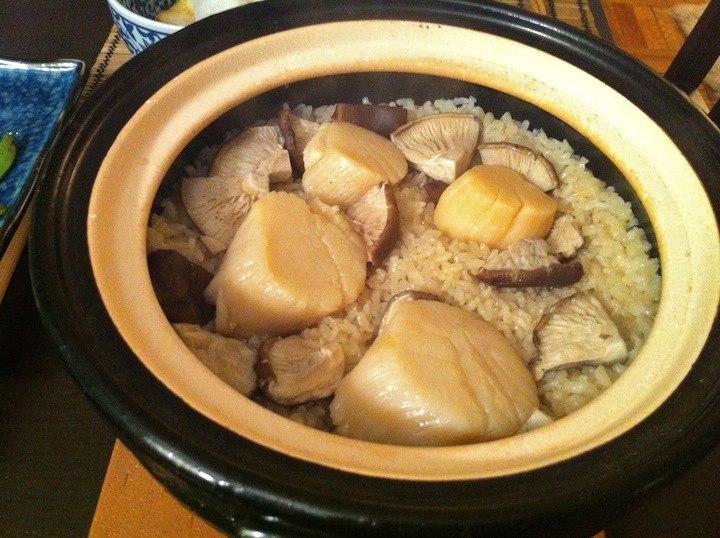 He placed quartered Shitake mushrooms and large whole scallops on top of the rice and cooked it over high heat for 15 minutes and then let the rice rest for another 20 minutes. The whole process took about two hours from start to finish. As the rice rested, the kitchen and the living room filled with this intensely savory and gloriously appetizing aroma. 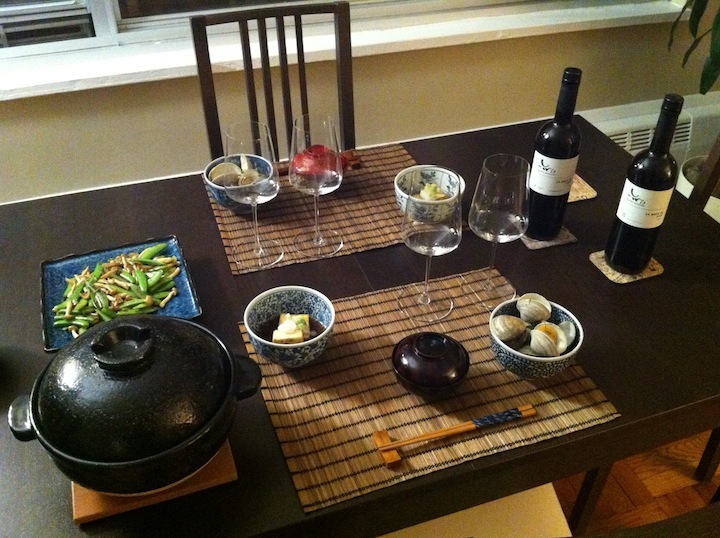 Peter opened the Donabe, coarsely chopped the scallops with a wooden spoon, fluffed the rice a little, and served it in bowls topped with scallions and mitsuba, a Japanese herb. This was the very best rice I have ever eaten, without any question. One of the best foods I have ever eaten. I will not try to describe the flavors because I'm not good enough with language to do so. Since watching this preparation and eating this rice, I've thought some about how simple things can be so complex. 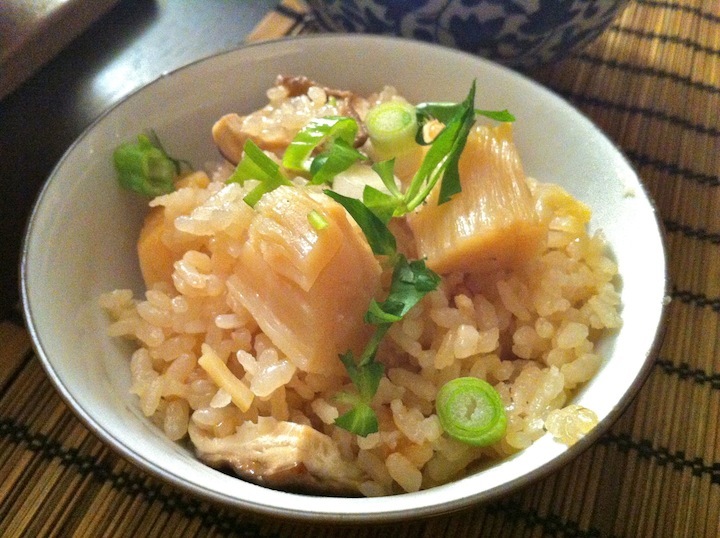 I can enjoy the rice at a Chinese restaurant, or the rice I cook at home, and it tastes good. It is nice to eat with whatever other food I'm eating. I do not need rice to be the finest rice Japan has to offer, prepared in the finest of Donabes by an expert hand in order to appreciate it. But I'm glad that I now know a little tiny bit about this - about what is possible to achieve with rice. It's not that I will now look down upon all other rice, it's about the fact that there exists a complex set of tools and techniques for growing and cooking rice, and being aware of this makes me a more educated person. We mostly think of rice as a simple thing, and that doesn't reduce the pleasure we take in it. There is an elevated form of rice too, and that is also pleasurable, I would say immensely so. These two things are not mutually exclusive. The same is true with so many things that we eat and drink - think of roasting a chicken! There are a million variations, including the chicken itself, temperature, type of pan, and other issues. People who care about roasting chicken have opinions on all of these things. Roast chicken is a simple thing that is also quite complex, should you choose to approach it that way. And although a decently prepared roast chicken is always enjoyable, some are finer than others. I think that experiencing and trying to understand things in their most elevated forms allows us to better understand the pleasures (and flaws) of their more common versions. I hope that in the coming year I learn more about the complexities that seemingly simple things have to offer. And I hope to spend more time in the company of great friends, enjoying these things together. I hope the same for you, and happy new year! Ready for a little complaining? It's the holidays, I know. But indulge me. I was in Stockholm recently and ate dinner at two different restaurants. In both cases I found the wine service to be excellent. I remarked to my dining companions, who also are wine lovers, that I appreciated the service, in particular the fact that the servers were in no hurry whatsoever to pour our wine. Instead they would open a bottle, offer a taste, and then pour a small glass to each person. Then, they would walk away. This might not sound terribly special to you, but I very much appreciated it. I find that in many restaurants, servers are in a rush to pour wine and they pour very large glasses, filling the vessel more than halfway. Filling the glass that high is just annoying - it's hard to handle the glass when it's so top-heavy. And I find it hard to enjoy the aromas when there is so much liquid in the glass sloshing around, and so little room left within the glass for air. If I order wine at a restaurant I want to let it unfold and change in the glass, and I want to experience and enjoy those changes. It's hard to do that if before I've even come close to finishing what's in my glass, the server pounces and re-fills me. 1) Happy customers leave bigger tips. 2) Two people dining together rarely order two bottles of wine. Sometimes they do, but I'm guessing very rarely. So when there are two people at the table, pouring fast and high typically results in the sale of 1 bottle of wine, the same number of bottles that sell when the server pours at a relaxed and leisurely pace. But those two diners will feel happier when they are allowed to enjoy their wine at a leisurely pace, their experience will be better. They are likely to tip more. 3) If a table of four or more people is inclined to order multiple bottles, they will do so because they want to drink wine, not because the server rushes them. Okay, sometimes people will say "what the hell" and order another bottle when the first disappears quickly. But the table that orders another bottle because they are rushed is probably not ordering expensive wine anyway, so the impact on the tip won't be huge. Allowing a table of four to be relaxed about enjoying their good wine encourages them to order more wine. Here is an example of how a restaurant and a server lose revenue when they pour high and fast: I was with a friend at a popular Manhattan wine bar not long ago. We decided to splurge and ordered a bottle of Champagne. It was a wine I'd never tasted before and I wanted to take my time, to explore the wine. Our server essentially poured the whole bottle into our two glasses within minutes. We couldn't take a sip without having our glasses refilled, and poured way too high. We drank our wine, paid, and left. We might have ordered more wine, but the experience of drinking the Champagne was not so pleasant. Here is an example of a relaxed pour leading to a good experience: A restaurant in Stockholm called Rolfs Kök ('Rolf's Kitchen' in English, I believe. Get your mind out of the gutter). There were four of us, and as we looked at the dinner menu I selected a bottle of 2002 Hirsch Riesling Heiligenstein from the wine list. The server tasted it and decanted the bottle at a side station, returned to the table, poured me a taste, and then each of us a small glass. He left the decanter at the table and went off to do other work. We talked, chose our dinner, enjoyed our wine. The few Austrian wines I've had from the 2002 vintage have been weird, and this one was too, but it opened nicely and was lovely to follow over an hour. Yes, we drank that wine over the course of about an hour. 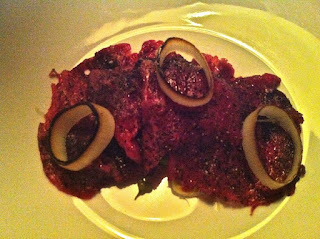 But by then we had decided upon our dinner, which would include Elk, and we ordered a bottle of 2007 Fourrier Gevrey-Chambertin. The server decanted that too, and left the bottle at our table. He returned to pour small glasses as our main courses arrived. We refilled sometimes, he refilled sometimes, and it was relaxed. The wine was very good, strikingly pure and crackling with energy. One friend thought it needed another two or three years in the bottle, I thought it was lovely as is. We enjoyed having the opportunity to see how it changed in the glass. We left a very nice tip. One of my dining companions in Stockholm commiserated with me on this pet peeve of mine, the high and fast pour. His wife laughed and agreed that the high and fast pour drives him crazy. My friend is an economist, however, and he often finds simple and efficient solutions to life's little problems. "You know what I do about this now," he said to me. "If I order wine at a restaurant, when the server brings the wine I smile and very politely say to them 'If you don't mind, we will pour our own wine.'" Wow. Simple and polite, perfectly reasonable. Can it really be that easy? I've thought about this now since my friend suggested it and maybe it is that easy. Sure, there will be times when I'll miss out on good wine service if I preempt the server and say that I'd like to pour my own wine. But more often, I think I will have a better experience (and leave a better tip because of it). I'll try this in early 2013 and let you know how it goes, because I know you are waiting with bated breath. If this is a pet peeve of yours, how do you deal with it? I recently had the occasion to be in Stockholm, Sweden (! ), a trip for work. The whole trip was amazing, but I want to tell you about one meal I had there, what easily for me is the dinner of the year in 2012. What made it so good? Well, the company, for starters. I work with really nice people. And the wine. The list was interesting and smart, and there were a few gems that are quite difficult to find back home. 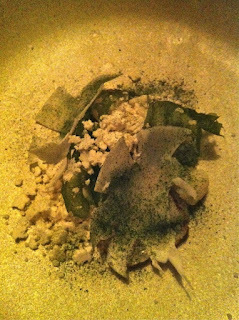 And the food was wonderful, showing an honest dedication to local ingredients and typical Swedish cuisine, and also prepared with a modern sensibility. The restaurant is called Volt, and if you ever have the good fortune to be in Sweden, I strongly urge you to eat here. 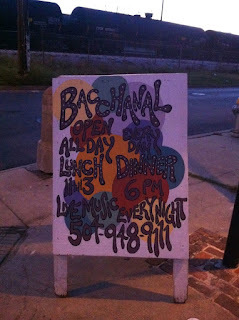 Not cheap at all, but one of those expensive meals where there is no doubt that you have gotten your money's worth. 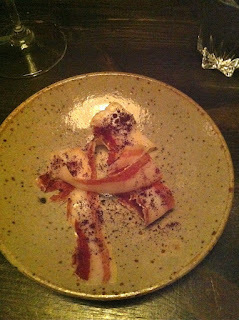 While looking through the menus we were served this amuse, a plate of thinly sliced cured, spiced pork belly. 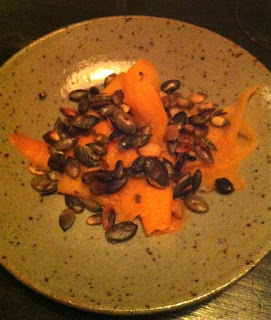 And this plate of lightly pickled pumpkin topped with pumpkin seeds. Both were appetizing and delicious. The bread service was wonderful - crusty, airy, fresh bread, served with tangy local cultured butter and chicken liver paté. 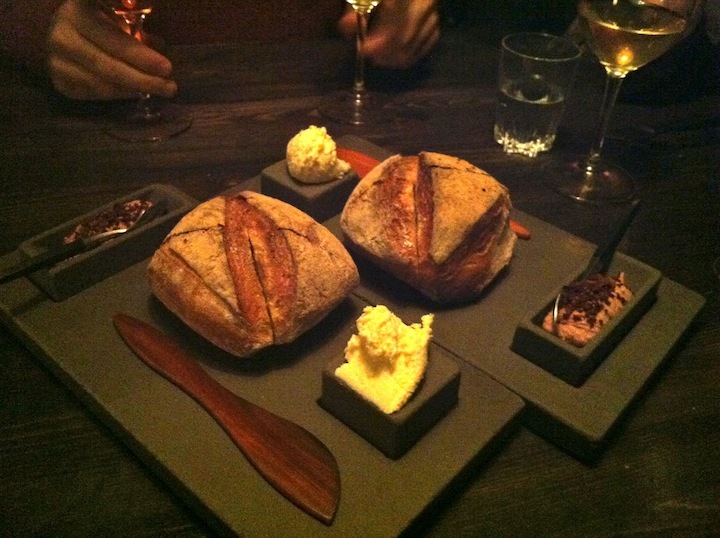 We had a 6 course meal coming, and yet we couldn't stop eating this bread. 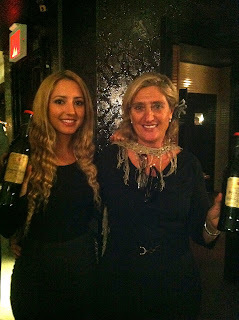 I saw a few special bottles on the wine list, and we decided not to select from among them, instead ordering them all! And we got the 6-course tasting menu too. We were in Sweden, near the holidays. Why not splash out a little? 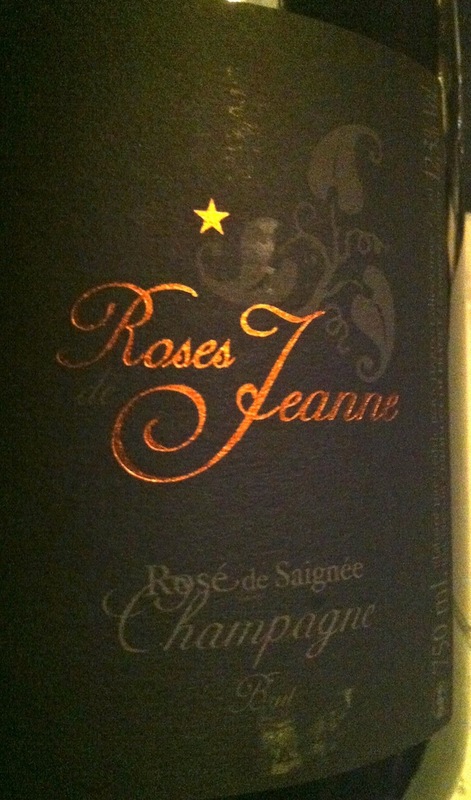 First we ordered this beautiful bottle of Cédric Bouchard 2006 Roses de Jeanne Le Creux d’Enfer Rosé. This wine, Bouchard's single vineyard rosé, has become essentially impossible to find here in the US.And it is very expensive. Oddly, in Sweden, one of the most expensive countries in the world for an American, and at this fancy restaurant, the wine was no more expensive than it would be on the shelf at a NYC retail shop. Except it will never again be on the shelf at a NYC retail shop because almost none is made and it is snapped up by collectors before it hits the shelves. 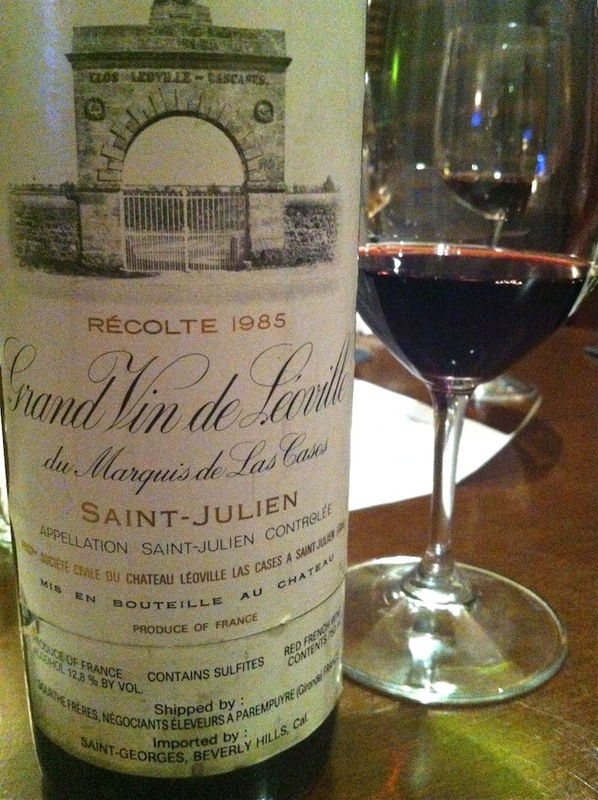 It is a wonderful wine and a few years of age amplified the savory tones. After a few hours the wine showed clear bitter herbal notes that you might find in Campari. We ate langoustine with seafood broth, thinly sliced turnips, caviar, and langoustine crackers. At about this time I realized that we needed to submit to how good everything was going to be, and we ordered two bottles of Overnoy wine - the 2010 Chardonnay and the 2011 Poulsard. Our gracious and incredibly competent sommelier decnted the Poulsard for us and we enjoyed the beginning of the Chardonnay with the Langoustines. And then came scallops, with raw cauliflower crumbles, gooseberries, and several "sea-lettuces." Excellent with the bright and expressive Chardonnay. 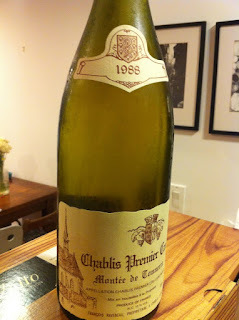 Overnoy bottles are never uniform, and this bottle of Chardonnay was different from the bottle I drank in July. Not as perfect, not as focused. But it was lovely nonetheless. We returned to Bouchard's Champagne for this fantastic dish of beef carpaccio with almond and parsley puree. Two summers ago I was at a ridiculous Bouchard dinner and we drank the 2007 Rosé and it was suggested that rare beef would be a great pairing. Well, on this night I was able to verify that indeed, this is a wonderful synergy of flavors. Then we ate Pike Perch from the Baltic Sea, local waters. 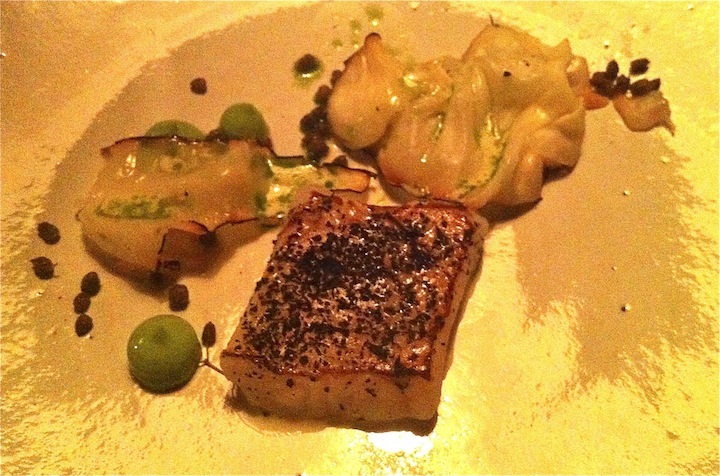 It was perfectly cooked, meltingly tender, and served with roast cabbage, fresh cockles, and capers fashioned from elderberries. 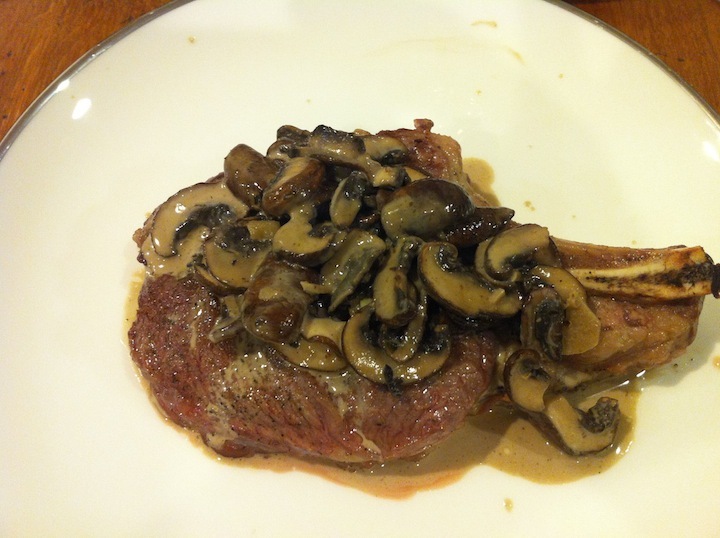 Whoa, this was delicious and expertly prepared. 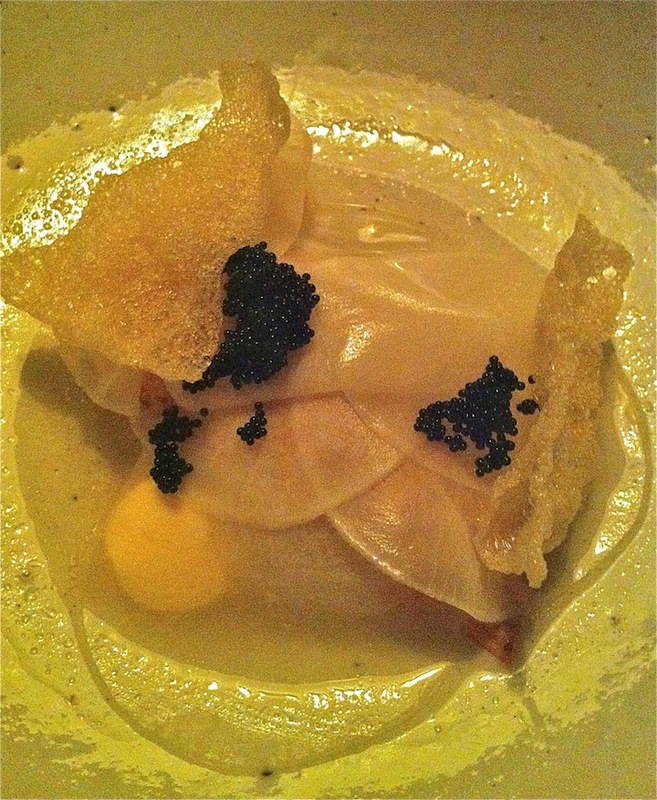 And great with Overnoy's Chardonnay, which was becoming more and more detailed as time went by. The sommelier appeared with the decanter of 2011 Overnoy Poulsard. "Like raspberry juice," he smiled. And he poured. I've had great bottles of Overnoy Poulsard, and also completely uninspiring bottles. If you drink the wine outside of France, there will be variation. This bottle was amazing, among the best Ive had. 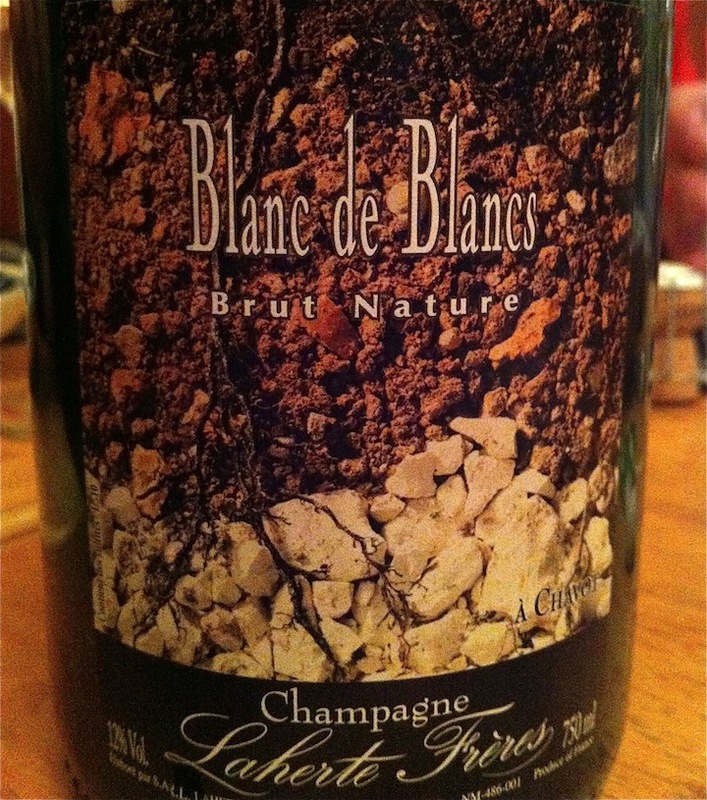 Such intense aromas of dried roses, so detailed and complex, such delicate texture and such presence in the mouth. As perfect as Poulsard can be, I would say. A wonderful and moving wine. My companions had never before had an Overnoy Poulsard and they were swooning. It was fun to watch. We drank it with a dish of "fallow deer," a small variety of local deer. Very lean, it was served with Jerusalem artichokes and topped with fresh juniper berries. Yes, fresh green juniper berries. I've seen only the dried black ones here. 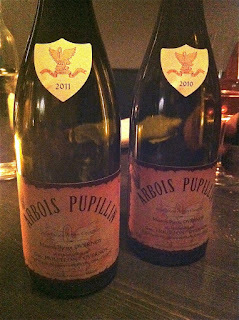 These were vibrant and pungent and herbal and very compelling, and they amplified the forest undertones of the Poulsard. What a meal we were having! After that dish we took our time finishing our wines, reveling in our good fortune. And then we had dessert. 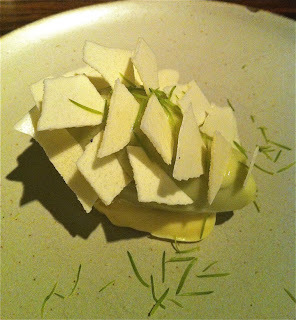 The best restaurant dessert I've had in years. An oval of green apple sorbet, tart, not sweet, served on a dollop of white chocolate pudding, white chocolatey but not sweet, topped with shards of frozen green apple and young pine needles. 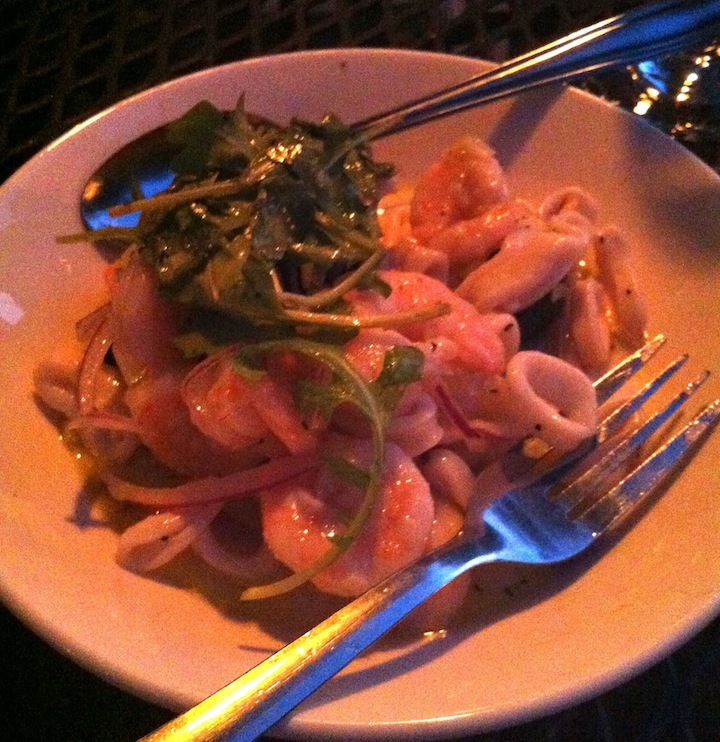 Absurdly delicious. And with this, a glass of sparkling wine from Anjou that smelled like pine needles, something the sommelier selected for us. An incredible meal that I will remember for a long time. I hope that as 2012 comes to a close, you are enjoying delicious food and wine too, with good friends. In early spring of 2006, my wife at the time (we are now divorced) got me a lovely gift for our first anniversary, a leather-bound journal. The idea was that we would both write in it, describing the wines we drank together and the circumstances in which we enjoyed them. 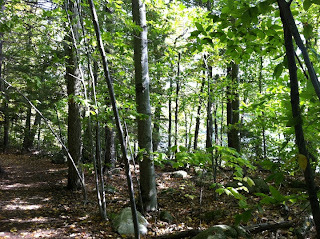 I hadn't yet begun writing this blog - that happened in October of 2006. I stumbled upon this leather journal the other day while rummaging around in the closet. There are fewer than 10 entries in it, the book is mostly empty. But the wines are interesting: 2001 Clos Rougeard Les Poyeux, 2002 Breton Bourgueil Perrieres, 2004 Closel Savennieres Clos du Papillon, 2001 Lafarge Volnay, 2004 Baudry Clos Guillot, some Oregon wines. We were drinking good stuff. There is one entry in there about a wine that is different from the others, something older, something we drank on a special occasion. I remember that I wanted to buy a special wine for our first wedding anniversary dinner. I went into Chambers Street Wines and spoke with David Lillie. After some discussion, I emerged with a bottle of 1986 Chateau Sociando Mallet. I spent something like $80 on the bottle, way more than I had ever before spent on a bottle of wine. David cautioned me to stand the bottle up 3 days or so before opening it, to open it carefully so as not to disturb the sediment, and to decant the bottle if I could. I followed David's advice and we loved the wine with our dinner. I'm not going to reproduce my part of our journal entry on this wine, but here is the first thing I wrote: "This is beautiful wine. 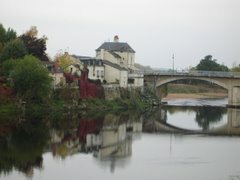 I understand now why Bordeaux is so beloved." Look at that last sentence. I love how exuberant I was, how eager to experience this new pleasure. I can't say that I remember the wine but I'm sure it was very good. Sociando Mallet is a respected estate making high quality wine, but it's not considered to be one of the great wines of Bordeaux. No matter, I didn't understand that then and I was falling in love with wine, details like that would not have reduced my visceral pleasure anyway. A lot has happened since then. I have two wonderful children, but I am no longer married. I work at a different job and I live in a different place. Many of my friends are different. I have grayer hair, and depending on your eyesight and on the relative humidity of the day, 10 or 15 pounds that I should lose. I have a different set of worries and problems that I deal with on a daily basis, and also a different set of joys. It's a strange road, this life we lead, and as John Sterling, the stalwart radio voice of the New York Yankees likes to say, "You can look at all the statistics you want, and they tell you what this guy did in that situation a thousand times in the past, but they don't tell you what's going to happen right now. You cannot predict baseball." 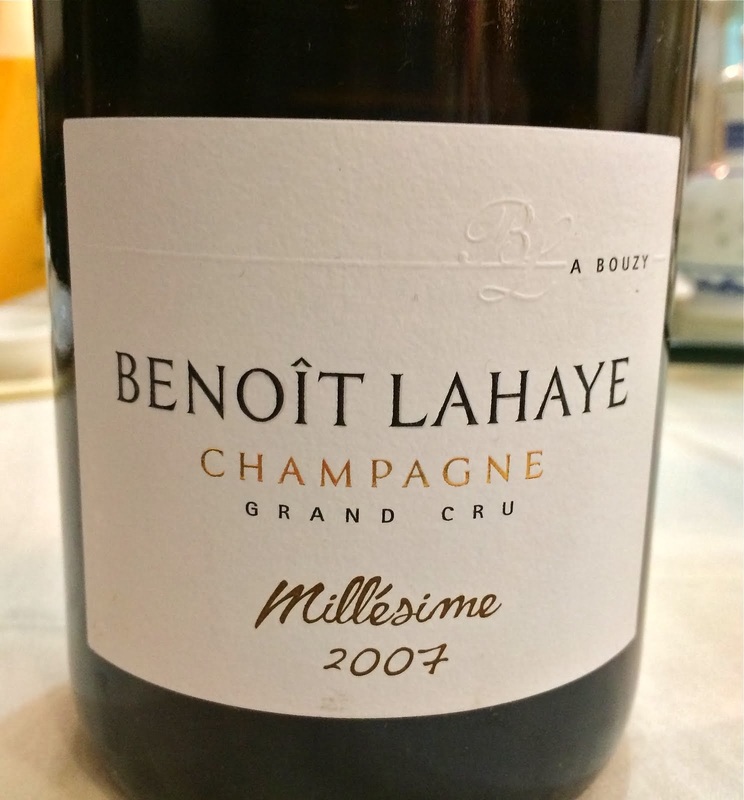 Holiday season is approaching, the end of the year draws near, and I was thinking the other day about some of the great wines I drank this year. Gentaz Côte-Rôtie, early '80s DRC Grands-Echezeaux, late '80s and early '90s Montrachet, Coliseo, the grand old Amontillado by Valdespino, and more. And that's just the fancy stuff - there were so many more great wines that are easier to locate, and easier on the wallet. I loved drinking many of these wines and the experiences that came with them, but it was only a few days ago when I drank the wine that made me fall in love with wine again. I was at a good friend's house and he made a lovely dinner that included a beautiful butterflied leg of lamb, pungently seasoned with ground black olives, fennel seeds, dried chili flakes, and all sorts of other goodies. With this dish he generously opened a bottle of 1985 Chateau Leoville Las Cases, a grand wine, from a very good year, and a classic pairing - lamb and Bordeaux. Exciting! The wine was awesome, really. It took about an hour to flesh out, but it was SO good when it did. The thing that killed me about this wine was how absolutely clearly it spoke of the place it is from, and how it expressed itself with such profound finesse, and also how completely and purely delicious it was. The fruit was lush and ripe, and it was textbook dark cassis. Not sweet fruit, dry. And the minerals - all pencil lead and gravel and dried tobacco. And there was that cedar smell too that people speak of when they talk about Bordeaux. I felt while I was drinking this wine how different it is to drink Cabernet - I almost never drink it. Honestly, it felt like close to a perfect wine, and I fell in love with wine again. Not that I had stopped loving wine, but it had been a while since something really moved me. I drank things I enjoy, tried some new things, definitely experienced pleasure. But it had been a while since I felt truly moved, and I had kind of drifted into this complacency, this place of moderately lower expectations. What a wonderful way to be shocked, to wake up and remember with full appreciation what it feels like to be moved again. It reminds me that I value being open to this sort of pleasure, from wherever it may come. Some people can get lost as they try to stay current on the wines that they should be loving. I will never do that, lucky for me. As I get excited about Champagne or Sherry or Austrian Riesling, or whatever it is I learn about and have new experiences with, I will never be closed to something as elemental and viscerally thrilling as a plate of well-prepared lamb and a grand old bottle of claret. Stodgy? Who cares. You never know where you will find the thing that makes you fall in love again. You cannot predict baseball. Two weeks ago, before the hurricane, there was Sherryfest. The main event, if you will, was a Grand Tasting held at Liberty Hall in the Ace Hotel. I think it's fair to say that the only human being in the room that day who was not in the least bit surprised was Peter Liem. He knew it would be a grand event, he knew that there would be way more people who wanted to be at the tasting than the space could accommodate, he knew that all of the producers would be there and pull out the great bottles, he knew that everyone would be blown away by the opportunity to speak with all of the producers and to taste all of the amazing wines. Everyone else was at least a little bit blown away. You could see it on all of the faces - the childlike glee. It was dark in Liberty Hall and I had trouble getting good photos with my mobile phone. I want to share a few images anyway. Felipe González -Gordon was there, of González Byass. 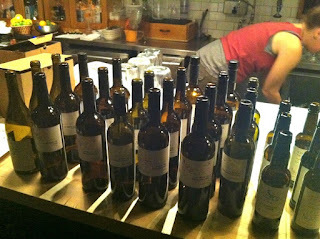 He poured maybe 10 or 15 wines, including the rare and wonderful Palmas. He is holding a bottle of Cuatro Palmas in this photo. The Palmas had not previously been available in the US, and it is exciting to think about being able to drink those wines here. Carmen Gutierrez of Gutierrez Colosía was there, along with her two very bright and lovely daughters. The Colosía Sherries are great in general, and I think that their Fino called El Cano (or not, depending on the importer) is a fantastic example of the style, showing a pronounced salinity that speaks of El Puerto de Santa Maria. 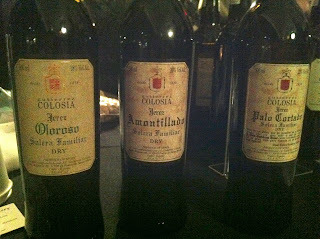 All of the Colosía wines showed very well on this day, and a highlight for me was tasting the three wines from the Solera Familiar. These wines are not yet available in the US, and I sincerely hope that there is an importer out there who will change this. These are stunning old wines that will thrill any Sherry lover. Jan Petterson of Bodegas Rey Fernando de Castilla was there, pouring his four Antique Sherries and also his basic Fino to rapt audiences. I love these wines. They are deep and complex, and they speak so clearly. They happen to be well priced, too. David Bowler recently added these wines to his portfolio, and this I imagine will be great for everyone involved. 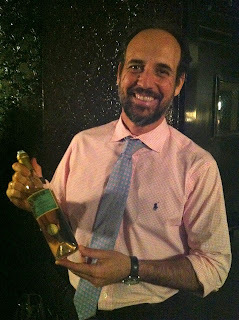 Lorenzo Garcia-Iglesias Soto was there representing Bodegas Tradición, the boutique Bodega that releases only four wines, all of them very old. There is a Palo Cortado, and Amontillado, an Oloroso, and a PX - there is no Fino. These are glorious wines and if you are interested in Sherry and haven't yet tried them, you really should. 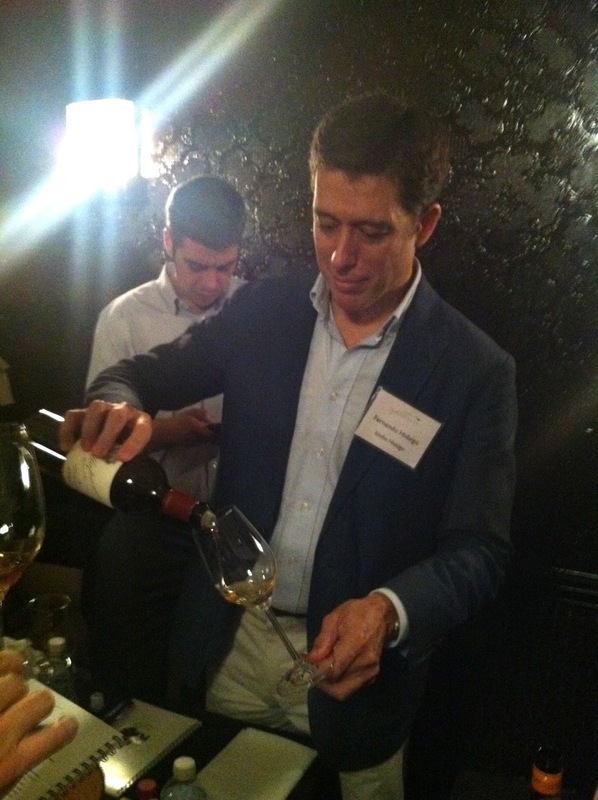 Lorenzo pours his Palo Cortado first, and I loved his explanation for why he does this. "This one has the most delicate aromas," he said. "It is floral and elegant. If I pour this after the more powerful Amontillado, the things that make this Palo Cortado so special will be lost." 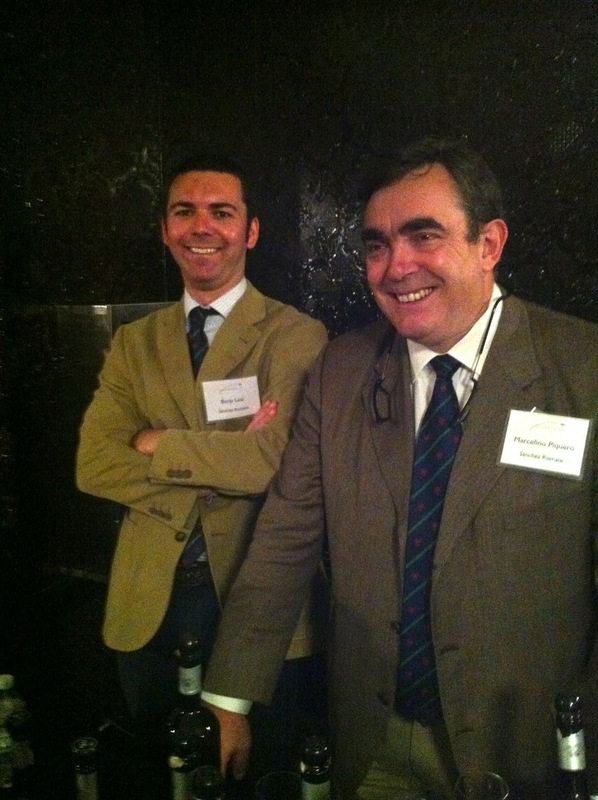 Marcelino Piquero (right) and Borja Leal represented Bodegas Sanchez Romate. I had never before tasted many of these excellent wines, as they simply do not appear on retail shelves. Romate is distributed by Southern, and Southern focuses on selling Romate's Cardenal Mendoza Brandy. I hope some one begins to focus on selling the Romate Sherries because they are quite good. By the way, the food at the Grand Tasting was well planned and delicious. Croquetas, cheeses, and all sorts of tasty morsels. And the jamon station was much appreciated. I parked myself there for a solid 15 minutes, and no one seemed to mind too much. 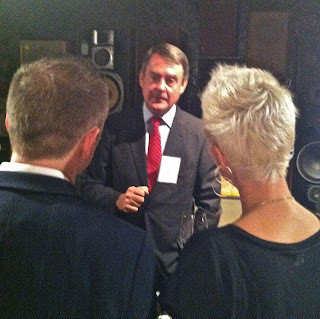 Many other producers participated too, from Valdespino to El Maestro Sierra to Lustau to César Floridio. 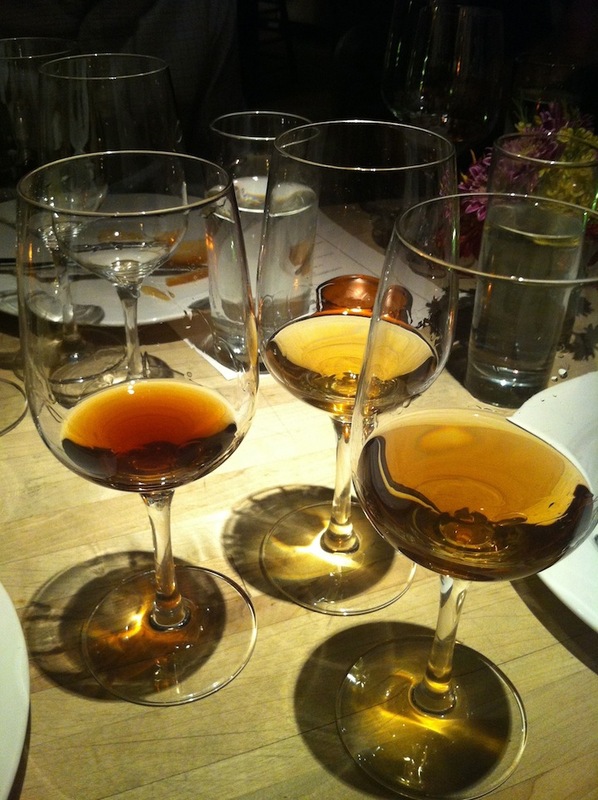 This was truly the greatest Sherry event ever on US soil, and I hope it was the first of many. Sherryfest, as you know, was the US's largest ever set of tastings and events dedicated to Sherry. It was created, in part, to honor the work of Peter Liem, whose Sherry book was just released. 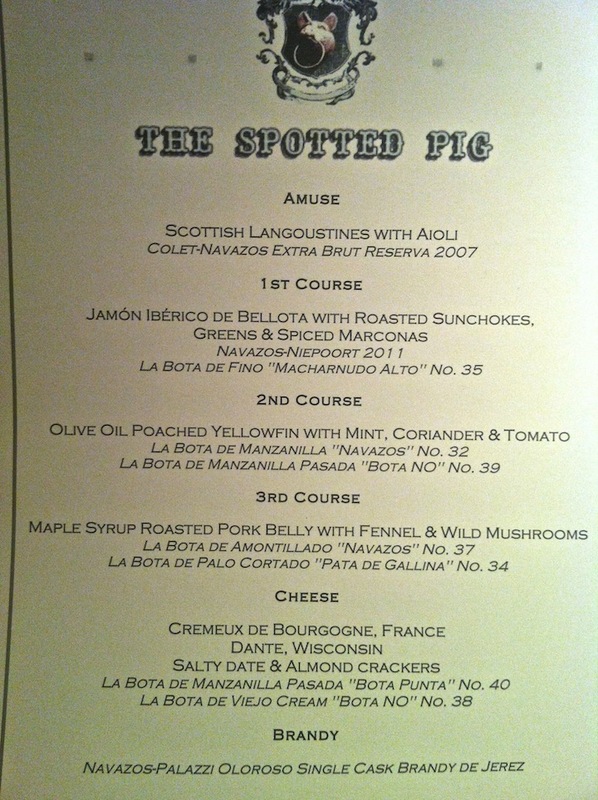 Sherryfest began for me, I am incredibly lucky to say, at The Spotted Pig for a special dinner featuring the wines of Equipo Navazos. Jesus and Peter outside of The Spotter Pig. This was one of the finest wine dinners that I have ever attended. All of the food was excellent, the wines were great, but what made this so very special (aside from the excited vibe in the room as Sherryfest was about to get underway) was the brilliant harmony achieved in each course. Wine Director Carla Rzeszewski is an ardent Sherry lover and she, Peter, Jesus, and Rosemary Gray (Peter's partner in Sherryfest) did a wonderful job making this dinner happen. But listen to this: Chef April Bloomfield, Sous Chef Edie Ugot on the left, and Spotted Pig Head Chef Katharine Marsh did a great thing in preparing for this dinner. They tasted every wine, talked about them with Carla, and created a menu that would brilliantly complement the wines being served. Seriously. This was a wonderful dinner. A dinner that impressed me in its attention to the smallest of details. 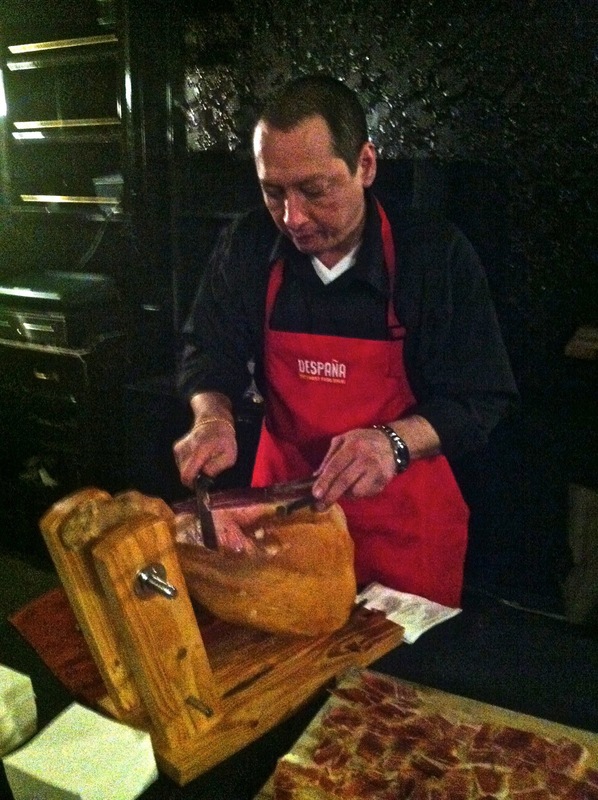 Jamon Ibérico is such a wonderful thing to eat and I've almost always seen it served solo, so that its subtle and complex flavors can be appreciated without anything else getting in the way. Here, a salad featuring this gorgeous jamon. Earthy roasted sunchokes supported the jamon, and did not interfere. A few grassy pea tendrils mixed into the greens had much the same effect. 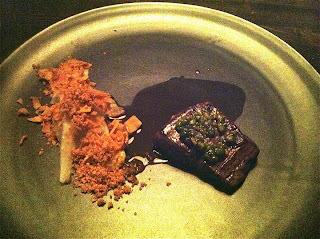 The wines were perfect with this dish. 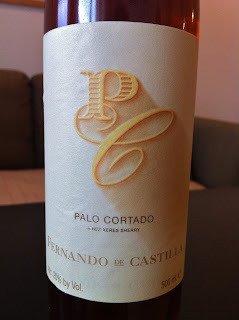 Until Sandro Pilliego of Palo Cortado suggested otherwise, I had kind of assumed that one would drink an Amontillado or a more elegant Palo Cortado with jamon. 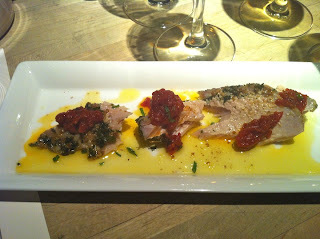 At this dinner, it was white wine - the 2011 Navazos-Niepoort and La Bota de Fino No 35, both newly released. The tangy energy of these wines worked so well with this salad. Tuna was poached in olive oil and topped with tomato. The menu said coriander, but I tasted fresh mint in there. This, for me, was a revelation. 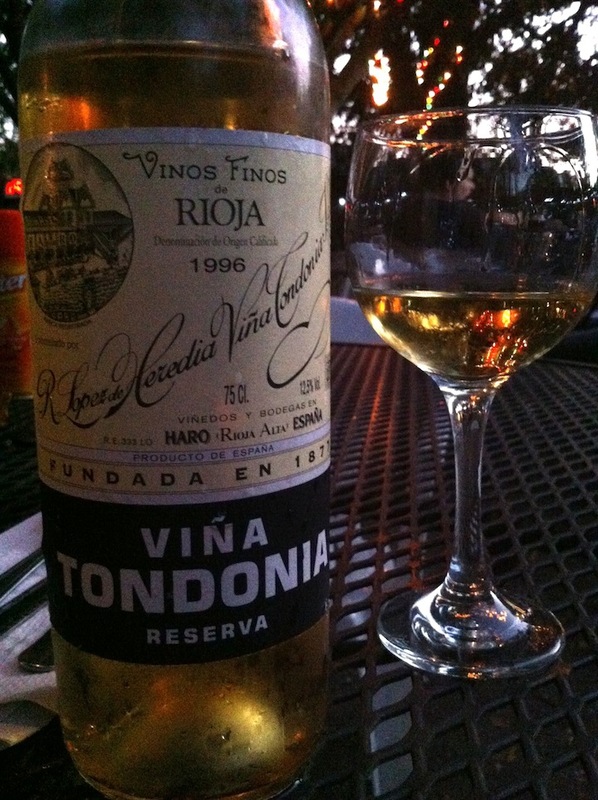 You know how Fino Sherry can show an oxidative side to its flavors (even though it is not an oxidized wine)? And you know how mint can leave a fresh, airy, and I would now say oxidative sensation in the mouth? Well, the mint in this dish and the gorgeously pungent and focused wines worked together in an eye-opening way for me. 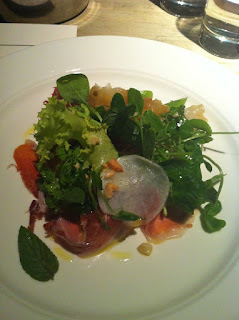 The mint highlighted the fresh and airy aspect of the wines in a very lovely way. The dish was paired with La Bota de Manzanilla No 32, the utterly wonderful latest release in a line of bottlings from the old Sánchez Ayala solera. And also with La Bota de Manzanilla Pasada "Bota NO" No 39, a wine that comes from a single barrel of Manzanilla Pasada from Bodegas Misericordia, of La Guita. This barrel is highly appreciated within that small Manzanilla Pasada solera, and therefore marked "NO" by the cellar master, to indicate that it should not be touched for blending or for any purpose, really. But Equipo Navazos was able to bottle a small amount, and this will be released soon. 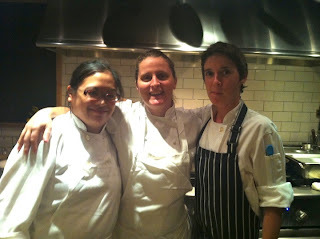 And here was, I can honestly say, as fine a pairing as I have experienced in 2012. Thick slices of maple syrup roasted pork belly, with crackling and crunchy skin on the end, some wild mushrooms and fennel. 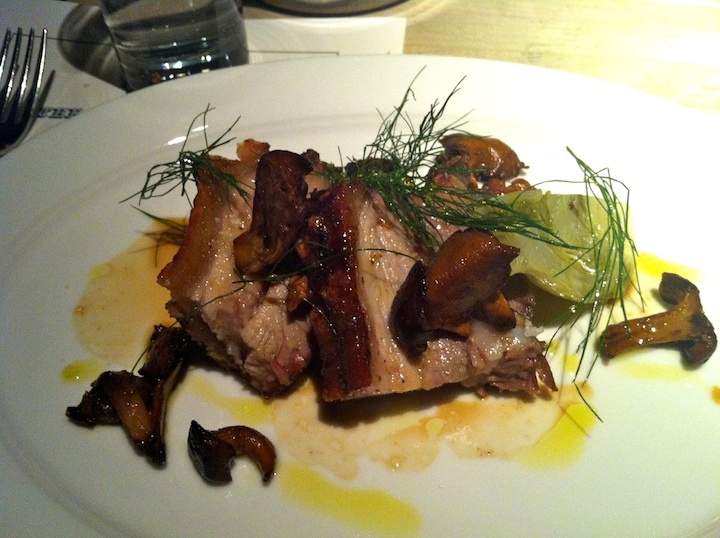 If there ever were a light and elegant version of pork belly, this was it. 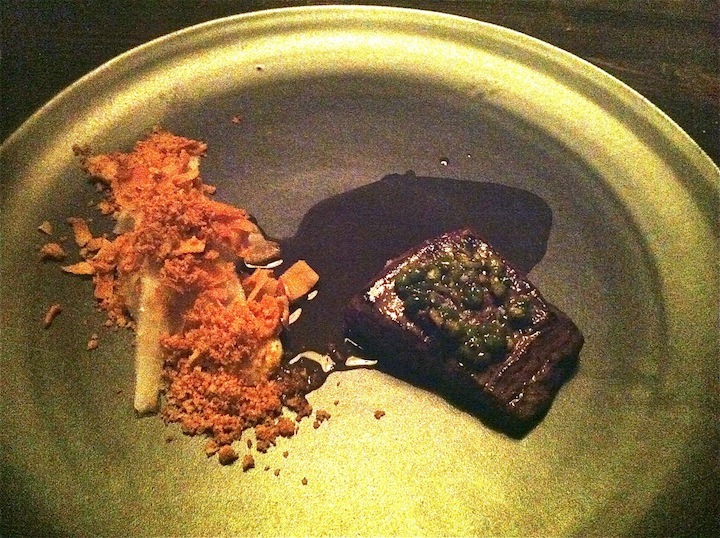 It was paired with two dark Sherries, La Bota de Amontillado No 37 and La Bota de Oloroso "Pata de Gallina" No 34. No 37 is an Amontillado that comes from a small solera in one of the La Guita Bodegas, and it is a thing of beauty. Saline, nutty, perfectly balanced and deeply complex, the way this wine worked with the pork was kind of stupefying. This is not to sell the lovely No 34 short - it also is an excellent wine, coming from an old Juan Garcia Jarana solera that was purchased by Lustau and released under its Almacenista label, and then sold to Fernando de Castilla, where it was bottled for this release. It is a very elegant and delicious Oloroso, and I need to spend more time with it because I will admit that I was so blown away by the particular synergy between pork belly and No 37 that I hardly paid attention to anything else. Such an wonderful evening! So great to gather with a load of NYC Sherry lovers and wine industry big shots, all in honor of the beautiful Equipo Navazos wines, of Peter Liem and his great new book, and of the festival of Sherry that he helped to create. 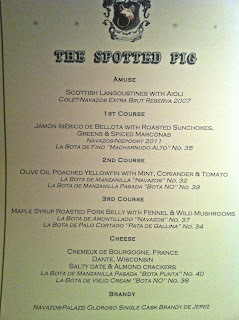 We left a lot of empty La Bota bottles sitting there on that counter in The Spotted Pig. We wandered out into the night, our stomachs full, our whistles whetted, smiles on our faces, ready for the Sherryfest to come. Haven't written anything here in a little while. Partly because I've been very busy. I've been working a lot, and some of that involves travel. I found this place in New Orleans called Bacchanal, where you can buy a bottle of wine from the shelf and then drink it out back amidst the large shade trees, eat something tasty, and listen to shockingly good music. 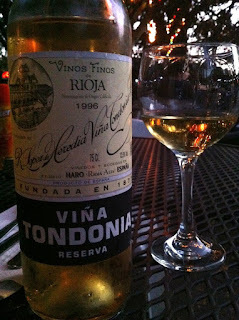 In that garden, I very much enjoyed the 1996 López de Heredia Tondonia Reserva. 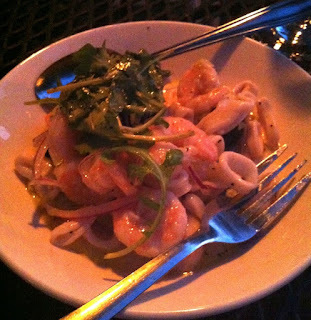 With a simple and lovely seafood salad. 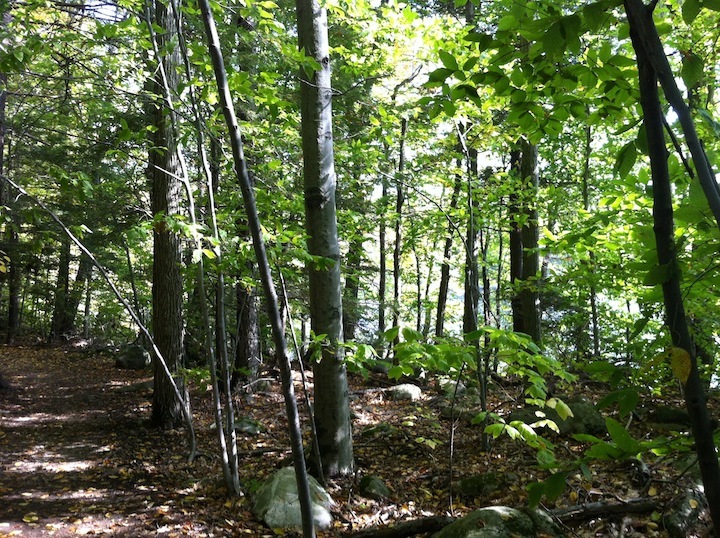 I've visited family and walked in the woods some. The nights are starting to get chilly and I've cooked some heavier food. 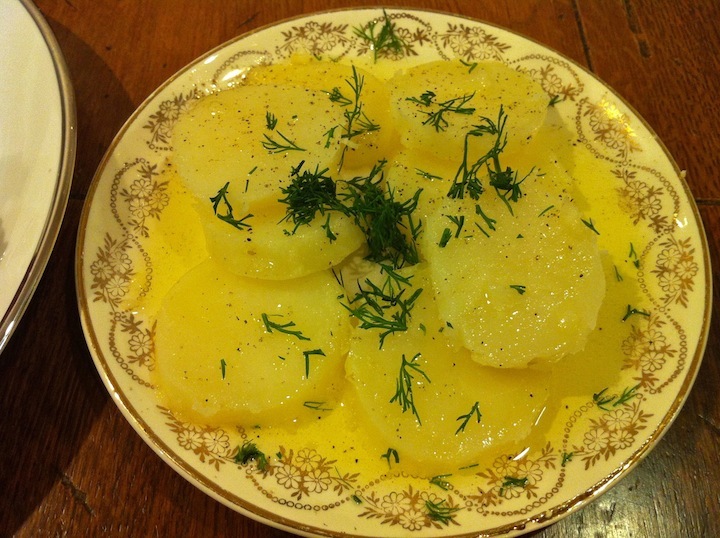 These potatoes with butter and dill were supposed to be like the ones you can eat on the Brighton Beach boardwalk. Not quite, but I almost got there. I continue to be surprised and inspired by how hard it is to prepare seemingly simple dishes. I've eaten at old and familiar restaurants, like Aliseo. 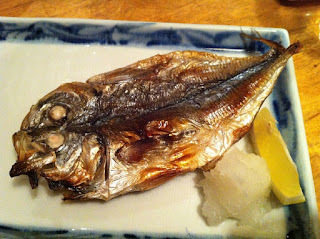 I've eaten beautifully prepared Aji (horse mackerel), at my favorite Japanese restaurant. Gorgeous with Champagne, by the way. I've drunk the new vintage of some familiar wines that I love. Bernard Baudry's 2010 Cuvée Domaine and Grézeaux are both very, very good. Also, some older vintages of familiar wines that I love. 2002 Huet...whoa! I've had some grand wines that are new to me. 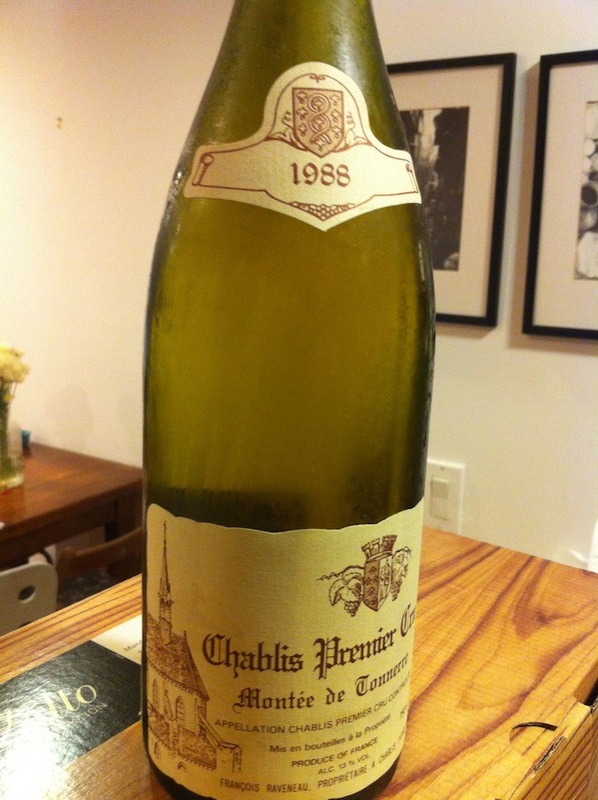 I'd tasted Raveneau before, but never sat with a bottle over dinner. 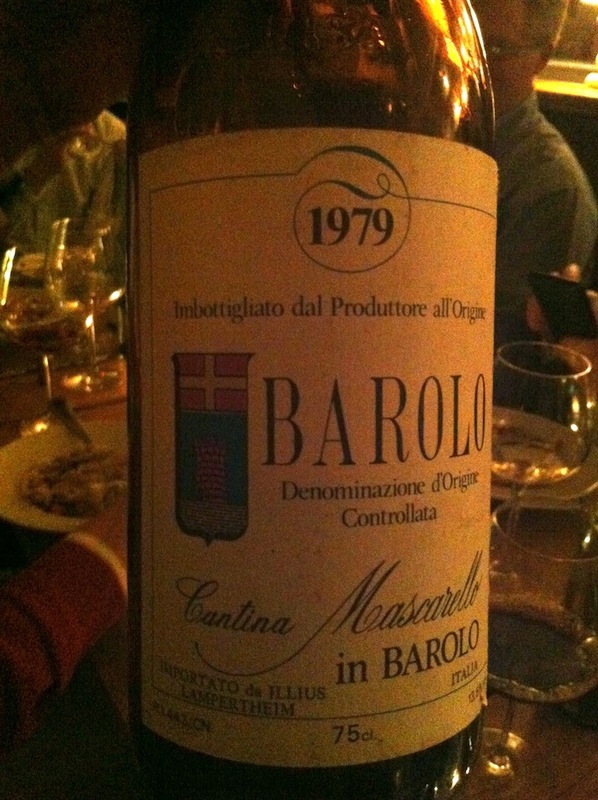 Same with Bartolo Mascarello. This wine was quite moving, I thought. And still very young, I kid you not. It's been a great fall so far. And now, we in NYC are lucky to be in the midst of Sherryfest, the greatest week of Sherry events that the US has ever seen. More on that soon. My oldest daughter was born almost six years ago. When my then-wife was approaching the end of the second trimester of her pregnancy, we decided to take a trip to France, to Burgundy. 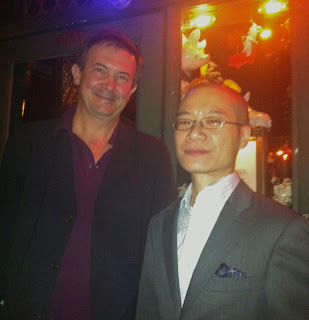 Before leaving I asked David Lillie at Chambers Street if he could recommend any producers we should visit. 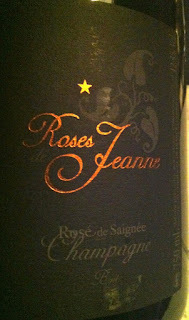 He generously set us up with Jeanne-Marie de Champs, a Burdgundian who has been in the wine trade for quite some time. She took us to visit several producers, one of whom was Jean Lafouge. We were completely charmed by the Lafouge visit. 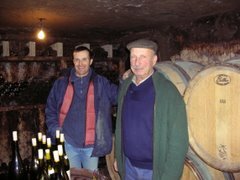 Everything was right - Jean and his son Gilles, the relaxed way they welcomed us to their work and their wines, the cellars, the house, the way they kept making sure my pregnant wife had water, did she want a chair, did she need more air, something to eat? The wines happened to smell and taste very good also. My daughter had been in her mommy's tummy for about 6 months at that point. I like to think that she also tasted those wines, the lovely whites from Auxey-Duresses, the properly oily and nutty Meursaults, the pure and complex reds from Auxey-Duresses and Pommard. She tasted other wines on that trip too, but something about the Lafouges and their wines - for me it just stuck. I resolved to include Lafouge wine in the little collection of 2007 birth-year wines I would amass for my daughter. True, Auxey-Duresses is not the most illustrious Burgundy terroir, but it is not the only wine I've saved for her. And some wines you save because they are great wines, others you save because they have a special meaning. 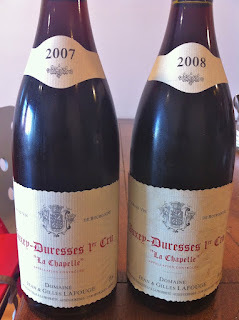 Lafouge Auxey-Duresses 1er Cru La Chapelle is an excellent Auxey-Duresses that for me has special meaning. 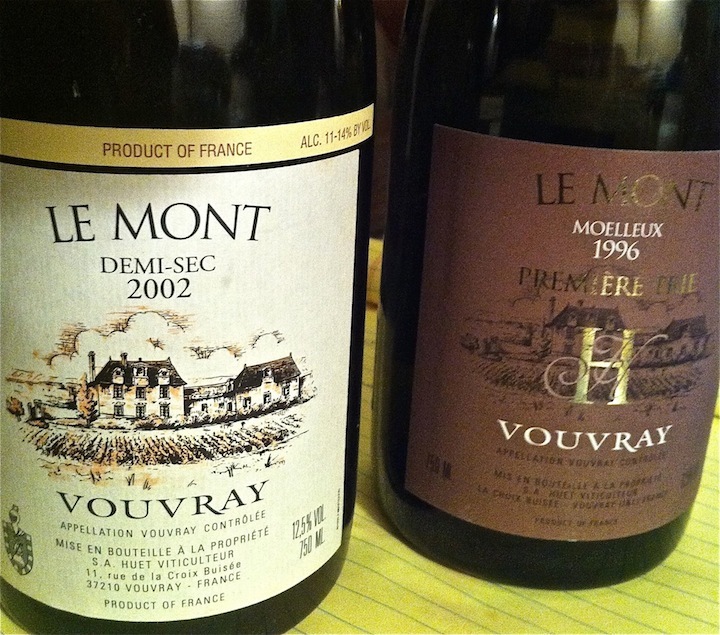 I like the other wines by Lafouge too, the reds are all good, and the Meursault is actually among the best values that I know of in white Burgundy. But La Chapelle for whatever reason is the one I put in the cellar. In fact, it's the only Burgundy wine that I buy each and every year. I buy Burgundy differently now, getting far fewer bottles of higher quality. But I always get a few bottles of Lafouge La Chapelle. My younger daughter has a birth-year bottle of La Chapelle waiting for her too. 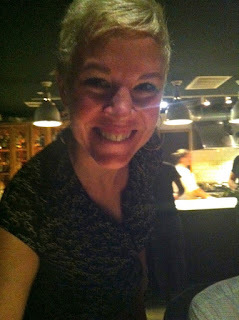 In NYC a lot has changed with Sherry in the past year. Sherry is lovable now, and this is a great thing. 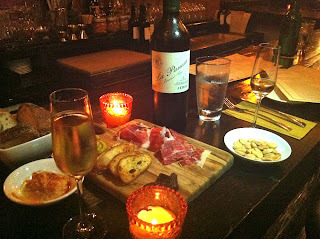 Emilio Hidalgo Fino Especial La Panesa and Jamon Iberico at Palo Cortado in Brooklyn. 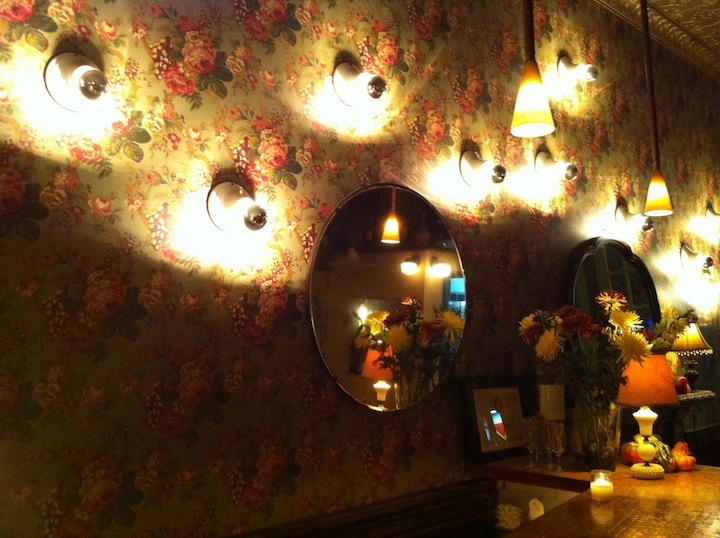 Any restaurant with modern or hipster ambitions has Sherry on the wine list. Wines that previously were difficult or impossible to buy here are now readily available. For example, almost the whole line of Valdespino Sherries wines are now imported by Polaner. In Jerez you can walk into any small grocery store and buy a 750 ml bottle of Inocente for maybe 8 Euros. Inocente has only been available (when it is available, which was rare) in 375 ml bottles. Tio Diego, the delicious young Amontillado and the excellent Palo Cortado called Viejo CP were unavailable here, except when the intrepid Joe Salamone at Crush would find a way to sell a few bottles. 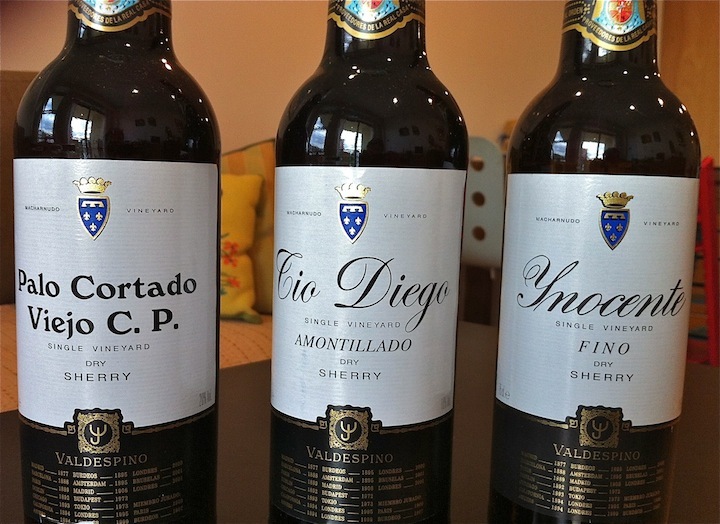 Now these and other Valdespino Sherries can easily be purchased at many stores. 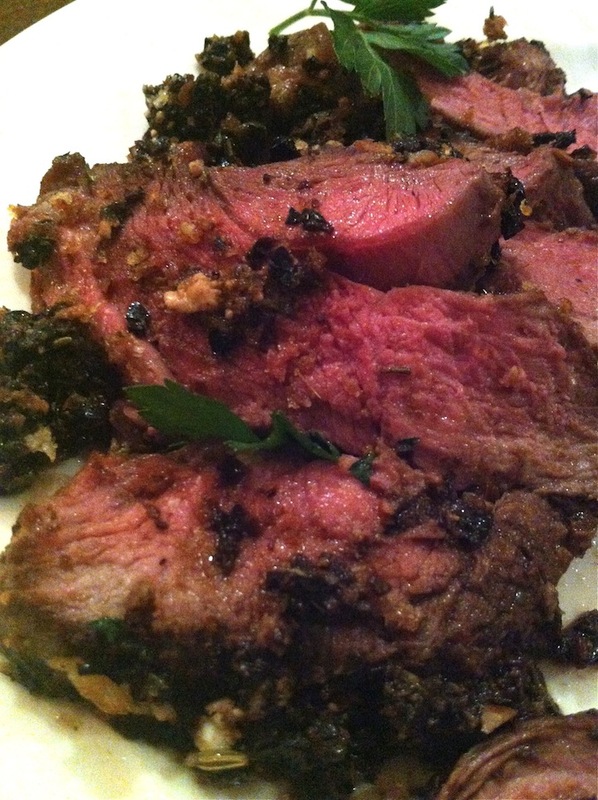 And let me tell you that there is nothing like a 750 of Inocente - you should try one. 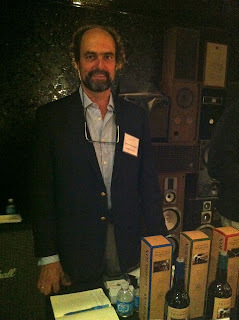 Fernando de Castilla's Sherries are now imported too, by David Bowler. The line of Antique Sherries is excellent - my favorite is the Palo Cortado, but they are all worth trying. 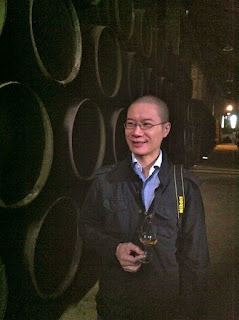 And my friend Peter Liem's new Sherry book will be released in less than a month! He wrote the book with Jesus Barquin of Equipo Navazos, and it promises to become one of the absolutely definitive pieces of writing about the region and the wines. To top it all off, Peter and Rosemary Gray have created what will be the largest and most important Sherry tasting the Unites States has ever seen. It is called Sherryfest. There will be a grand tasting on Monday October 21st (you have to register and reserve a spot if you want to go, demand is large enough so that they have to be serious about this). There will also be seminars where you can taste with cellar masters, and dinners at great restaurants that feature the Sherries of selected producers.